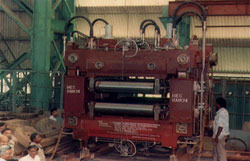 Continuous Casting Machine/Plant : Supplied to RSP, BSL, BSP & VSP for Turnkey Project execution/equipment. HEC was established in the year 1958 as one of the largest Integrated Engineering Complex in India. It manufactures and supplies capital equipments & machineries and renders project execution required for core sector industries. It has complete manufacturing set up starting from casting & forging, fabrication, machining, assembly and testing - all at one location backed by a strong design - engineering and technology team. The Plant has a fenced area of 5,70,000 sq.m and a floor area of nearly 2,00,000 sq.m. It is well equipped with sophisticated machine tools and handling equipments to undertake manufacture of heavy machinery and equipment of top quality. It is engaged in design and manufacture of equipments and components for Steel Plant, Mining, Mineral Processing, Crushers, Material Handling, Cranes, Power, Cement, Aluminium, Space Research, Nuclear Power etc.. It is the largest foundry and forging complex in India and one of the largest of its kind in the world. The area of the Plant is 13,16,930 sq.m accommodating 76,000 tonnes of installed machinery to cope up with the various operations effectively. This Plant is the manufacturer of heavy castings and forgings for various HEC make equipments and related to Steel plant, Defence, Power, Nuclear energy etc.. Manufacturer of Forged Rolls for Steel Plants, Crank Shafts for Railway Loco etc.